When a game describes itself as an "open world futuristic freerun / parkour game inspired by great games like Jet Set Radio and Mirror's Edge", it has my attention. 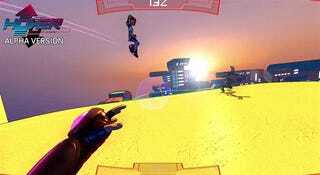 Hover : Revolt Of Gamers might have a stupid name, but everything else about it looks great, from the eye-smashing art style and future skating (the Jet Set Radio part) to the smooth parkour (the Mirror's Edge part, though you could argue it's got more in common with Titanfall's superhuman abilities). Hover is up on Kickstarter, but it's already passed its funding goal; the money coming in now is going to go towards stuff like bigger maps, more characters and, best of all, soundtrack contributions by Hideki Naganuma, who worked on the Jet Set games.